Info "I got separated from my parents and I wanna rejoin them, but I'm scared of getting hurt. Please help me!" Meet the Eggheads is one of Young Cricket’s Microgames in WarioWare: Smooth Moves. 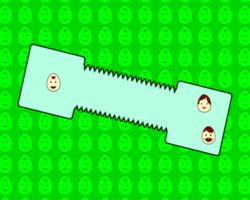 The player must point the Wii Remote to the lost egghead, then guide him through the maze. If it touches a spike, the player loses. 1st level difficulty: Linear maze. 2nd level difficulty: Maze has a turn. 3rd level difficulty: Maze has a couple turns. Rarely, this is same as level 1, but the maze moves around. This page was last edited on February 19, 2018, at 19:04.